RBTH presents a selection of views from leading Russian media on international events, featuring a report on Ukraine’s appointment of a new defense minister and analysis of potential scenarios for the development of the battle against ISIS radical jihadists in Syria and Iraq, with a key focus on the role of Turkey. The Kommersant daily reports that Ukrainian President Petro Poroshenko has nominated former National Guard commander Stepan Poltorak as defense minister for appointment by the Verkhovna Rada. Many of the parliamentary deputies who are tasked with approving a new minister are not particularly enthused by Poltorak’s candidature, the newspaper writes. However, Kommersant’s sources are confident that Poltorak has established himself as a man loyal to the president. According to Ukrainian political analyst Volodymyr Fesenko, Poltorak’s nomination is a reaction to the short-lived tenure of Valeriy Heletey as defense minister (Heletey’s resignation was accepted by Poroshenko on Oct. 12). Fesenko said the decision to appoint the former National Guard commander will neutralize the criticism being leveled at the president. 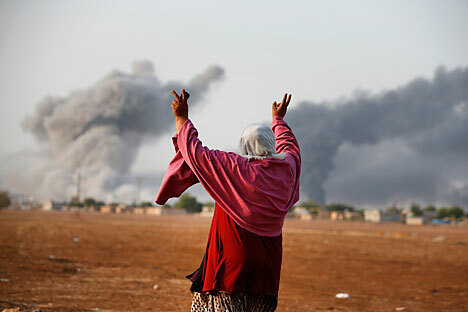 Nezavisimaya Gazeta writes that despite calls from the United Nations, Turkey is in no hurry to help the Kurds fighting radical Islamists in the Syrian city of Kobane. Georgy Mirsky, senior fellow at the Institute of World Economy and International Relations at the Russian Academy of Sciences, said in an interview with Nezavisimaya Gazeta that Turkey and Iran could defeat the Islamic State (ISIS) militants relatively quickly. However, for political reasons neither Ankara nor Tehran wants to introduce their own contingents into Iraqi territory. “There was a war between Iran and Iraq just 30 years ago in which half a million people died. Some disabled veterans are still alive. It goes without saying how they might feel about Iranian soldiers showing up on the streets of Arabic cities,” Mirsky said. For Turkey, sending troops to Iraq and Syria would mean strengthening the Kurdistan Workers’ Party, which Mirsky said is a more dangerous foe for Turkey than ISIS. “In second place is Erdogan’s enemy Bashar al-Assad, and the ISIS militants only come in third,” the expert said. Expert magazine has published an interview with Russian Turkologist Vladimir Avatkov, who thinks Turkey might soon launch a ground operation against ISIS. “Yes, Syrian Kurds are different from Turkish Kurds. They have different religions, different dialects, different clans that even feud among themselves,” Avatkov says. Avatkov added that if Turkey does decide to initiate an operation, in reality it will be fighting not so much against the Islamist fighters as against the Assad regime. “And this isn’t about personal antipathies against the Syrian president, but about sober calculations,” Avatkov says. “Firstly, this is about image. Attitudes towards Assad are very strained in Turkey, and the electorate of the moderate Islamic conservative AKP party simply does not understand the refusal to consider overthrowing him, all the more so since there are already Turkish troops in Syria. Finally, the Turks want to bring a regime to power in Damascus that is more loyal to Ankara,” he continues. According to him, in the case of an invasion, the following is likely to happen: The Turkish army will overwhelm the Islamists, who will retreat to Damascus, and after some time an opportunity will arise to seize the city. “Then Turkey will liberate the capital, eliminate unwanted Islamists, and dress the ones they want in suits and install them in power, thereby bringing a moderate-Islamic regime into power that is convenient for it [Turkey],” Avatkov says.